E tū represents 10,000 members in Public and Commercial Services (PACS). We cover public hospitals, cleaning, security, catering, clerical, schools, hospitality, tourism, musicians, union staff, and much more. More than two-thirds of PACS members are women. This is because occupations such as cooking and cleaning are seen as ‘women’s work’ and as a result these occupations tend to be undervalued by society and low paid. There are also a large number of migrants who work in the PACS industry and E tū is acutely aware of the need to stop the exploitation of these valuable members of our community. About half the members in public hospitals (the biggest group in PACS) are contracted out. The same contractors are active in tertiary institutions, schools, commercial cleaning and laundries. 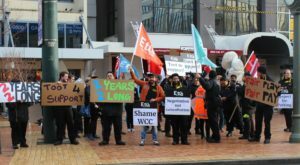 E tū is strongly opposed to the contracting model which encourages a ‘race to the bottom’ as contractors use low wages and poor conditions to get a competitive advantage.